Of all the holidays, Jared Chase Jackson, age 5, of Sacramento, California liked Christmas the best. Jennifer and Zack exchanged presents with Jared and told Christmas stories about the birth of Jesus in Bethlehem. The star on top of the Christmas tree reminded Jared of the one that guided the three Wise Men to the Christ Child. Gazing at the manger scene near the Christmas tree, Jared thought about following the star with the three Wise Men. Suddenly, a voice called his name. Jared quickly dressed in traveling clothes and joined the caravan. The bright star shone a silver path in the night. After riding a long way, they arrived in Jerusalem. King Herod commanded his servants to bring them to the palace. The Wise Men told Herod they were following the bright star to find Baby Jesus. Jared remembered Jennifer and Zack saying that Herod was afraid Jesus would one day be king, and that Herod really planned to destroy Baby Jesus. “I must tell the Wise Men about what Herod intends to do,” Jared thought. After the caravan left the palace, he explained Herod's evil plan to the Wise Men. “That scoundrel! In that case, we won't tell anyone where to find the Child,” said one Wise Man. “Jesus will be safe thanks to Jared,” added another. The caravan continued its long journey. The bright star guided the travelers like a beacon of light. “Jennifer and Zack would enjoy this wonderful journey,” thought Jared. Finally, the bright ray of light pointed to the small town of Bethlehem. Sheep, horses and cows silently welcomed the caravan. 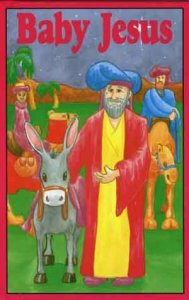 Joseph opened the door and invited the travelers inside. “Welcome, Jared. You have journeyed from a distant land,” said Joseph. The Wise Men entered and bowed low before Mary and Baby Jesus. They presented costly gifts of gold, frankincense and myrrh. Jared crept close to Jesus and His mother, Mary. The glow of light around the Holy Family became soft and golden. Jesus slept soundly in his mother's arms. Jared also felt sleepy. Finally a Wise Man gently lifted Jared onto the little donkey that waited in the Bethlehem night. He quickly fell to sleep during the long ride home. Jared could see that the manger scene near the Christmas tree had changed. The three Wise Men had presented their costly gifts, and the little donkey stood nearby. But Baby Jesus was no longer just lying in the manger. Now Jared held Jesus close to his heart.